COAL WILL LAST ‘A THOUSAND YEARS,’ TRUMP SAYS “CLEAN COAL,” MMHM? | "Global Possibilities"
Home » Energy » COAL WILL LAST ‘A THOUSAND YEARS,’ TRUMP SAYS “CLEAN COAL,” MMHM? COAL WILL LAST ‘A THOUSAND YEARS,’ TRUMP SAYS “CLEAN COAL,” MMHM? 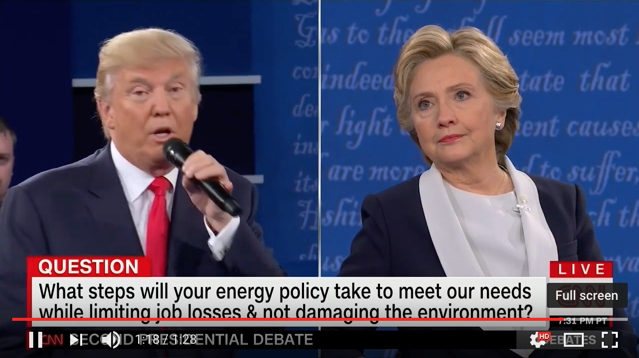 Climate change finally came up in a presidential debate. But, when it did, it was after Republican presidential nominee Donald Trump said we have to use our fossil fuel resources. In fact, attempts to achieve clean coal have mostly met with failure, including a billion-dollar boondoggle in Mississippi. It has also been widely criticized by climate and environmental activists, who say it will be catastrophic to embrace coal in any way. Clean coal is part of the official Republican platform this year. “Well, that was very interesting,” Hillary Clinton said during the response. She pointed out that climate change “is a serious problem” and added that investing in renewable energy presents a huge opportunity for the country. She also defended her position on coal communities, where she has proposed millions in infrastructure investment, including providing access to high speed internet.